Technical charts show improvement in at least one of the five major averages thanks to an increase in the price of oil. But most are still in negative territory. The Dow Jones Industrial Average (INDU , the S&P 500 and the Nasdaq Composite (NDAQ remain in correction territory with negative weekly charts. The Russell 2000 is in bear market territory with a negative weekly chart. But of the five major U.S. stock averages, the surprise is Dow Jones Transportation Average, which remains in bear market territory but has a neutral weekly chart. Its weekly momentum reading rose above the oversold threshold of 20.00 with a reading of 22.02 last week. A close this week on Friday above its key weekly moving average and 200-week simple moving average at 7,136 and 7,149, respectively, will shift the weekly chart to positive. There are two other dynamics at play. Friday's rebound in Nymex crude oil pulled the stock market higher, but investors should be aware that oil remains influenced by a key quarterly level of $29.90. The weekly technical chart for oil is negative and in need of a weekly close on Friday above its key weekly moving average of $33.34 to turn positive. Stocks have been tracking crude oil higher due to algorithmic trading, where computer-based high-speed platforms front run investors and buy key stocks and exchange-traded funds automatically when it detects a positive order flow into oil. Weakness in overseas economies has the major averages in Japan, China, India and Germany in bear market territory; negative interest rates in Japan and the European Union have been met by investors selling stocks. This negative is a bigger deal than the ups and downs of crude oil prices. The overseas markets rebounded on Monday and Tuesday, pointing to a higher open in the U.S. Tuesday. The Nikkei 225 gained more than 1,000 points on Monday and Tuesday, but it was down more than 3,000 since Feb. 1, and is still in bear market territory. In China the Shanghai Composite opened lower on Monday but gained 3.3% on Tuesday. This stability was somewhat surprising as the index did not trade at all last week as the Chinese celebrated the lunar new year beginning the "year of the monkey". The Chinese benchmark is still below a key level of 2,850.00. The Nifty 50 in India rebounded on Monday then had an outside day to the downside sliding 1.6% and still mired in bear market territory. The German DAX also had a strong recovery on Monday but is slipping a bit Tuesday morning. This average remains deep in bear market territory despite ECB and Mario Draghi making the ridiculous pledge to boost the inflation rate. Here's this week's stock market scorecard followed by the exchange-traded funds representing the U.S. equity averages. 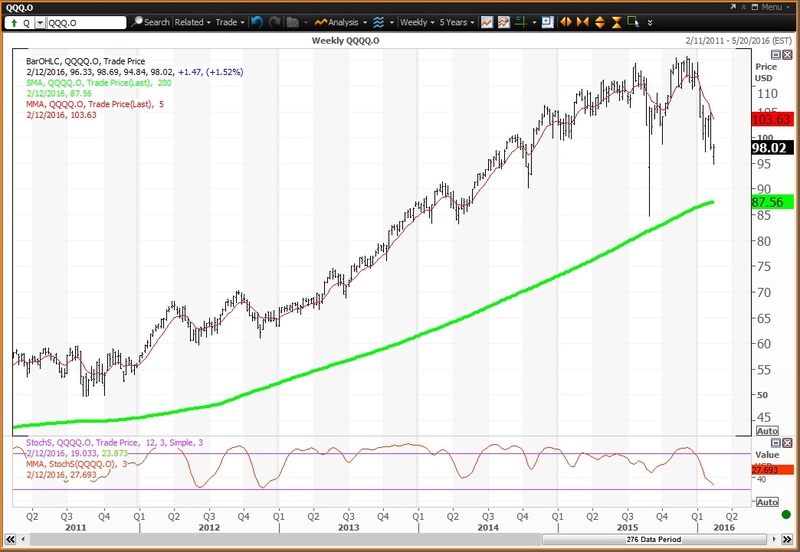 Here's the weekly chart for the SPDR Dow Jones Industrial Average ETF (DIA . The weekly chart for Diamonds is negative, but will shift to positive given a close on Friday above its key weekly moving average of $164.87, but if the close is below its 200-week simple moving average of $157.98, the outcome is negative. The weekly momentum reading ended last week at 31.44 down just slightly from 31.51 on Jan. 5. Investors looking to buy Diamonds should enter a good till canceled limit order to buy this ETF if it drops to $157.71, which is a key level on technical charts until the end of this week. Investors looking to reduce holdings should enter a GTC limit order to sell this ETF if it rises to $177.66, which is a key level on technical charts until the end of March. A key level of $161.40 continues as a magnet until the end of February. The downside risk is to $145.61 for the remainder of 2016. Here's the weekly chart for the SPDR S&P 500 ETF Trust (SPY . The weekly chart for Spiders is negative but will shift to positive if the EFT closes on Friday above its key weekly moving average of $193.29, but if the close is below 200-week simple moving average of $179.09, the outcome is negative. The weekly momentum reading ended last week at 30.17 down slightly from 31.22 on Feb. 5. Investors looking to buy Spiders should enter a good till canceled limit order to buy this ETF if it declines to $179.09, which is the 200-week simple moving average. Investors looking to reduce holdings should enter a GTC limit order to sell this ETF if it rises to $191.83, which is a key level on technical charts until the end of February. A key level for this week is $185.48, which should be tested during the week. 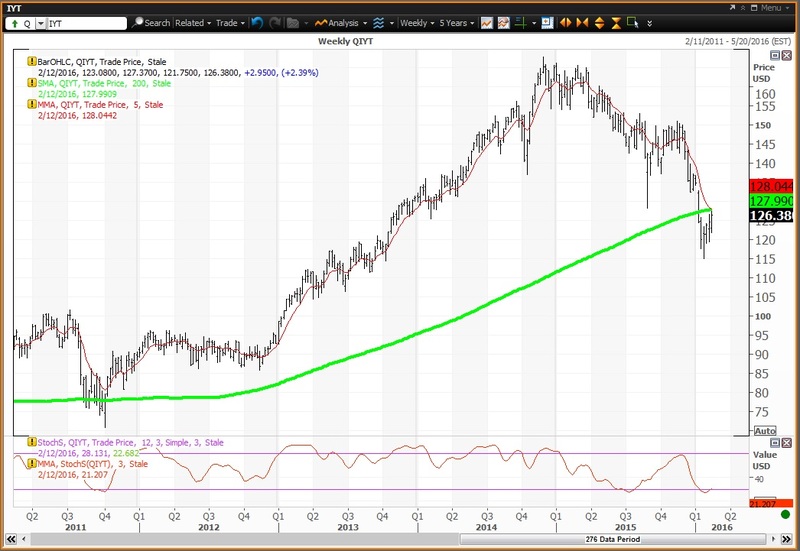 Here's the weekly chart and how to trade the PowerShares QQQ Trust ETF (QQQ . The weekly chart for the QQQs is negative with this ETF below its key weekly moving average of $103.63 with its 200-week simple moving average a major support of $87.56. The weekly momentum reading ended last week at 27.69 down from 32.02 on Feb. 5. Investors looking to buy QQQs should enter a good till canceled limit order to buy this ETF if it declines to $91.33, which is a key level on technical charts until the end of 2016. Investors looking to reduce holdings should enter a GTC limit order to sell this ETF if it rises to $106.06, which is a key level on technical charts until the end of February. A key level of $96.72 should act as a magnet for all of 2016, as it did last week. Here's the weekly chart for the iShares Transportation Average ETF (IYT . The weekly chart for Transports is neutral but will be positive if the ETF below closes on Friday above its key weekly moving average of $128.04 and above its 200-week simple moving average of $127.99. If not the chart will remain neutral as its weekly momentum reading closed last week at 21.21 up from 17.75 on Feb. 5, moving above the oversold threshold of 20.00. Investors looking to buy transports should enter a good till canceled limit order to buy this ETF if it declines to $123.832 which is a key level on technical charts until the end of 2016. Investors looking to reduce holdings should enter a GTC limit order to sell this ETF if it rises to $128.81, which is a key level on technical charts until the end of February. 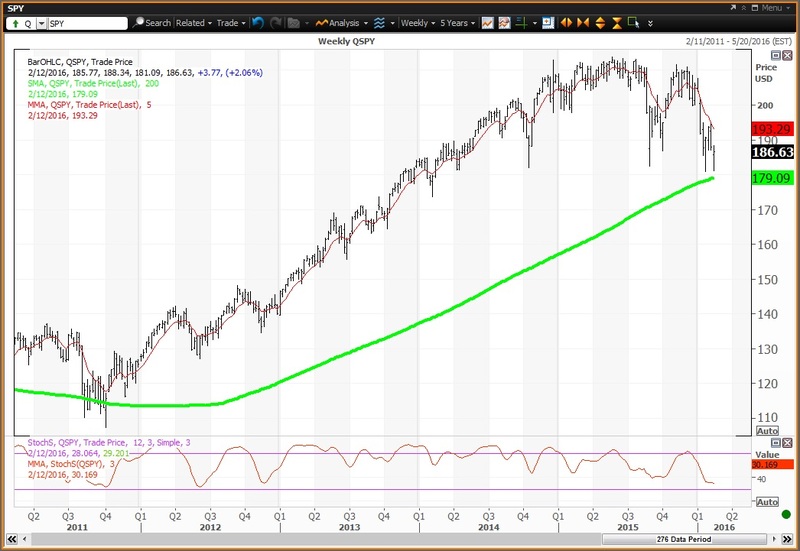 A higher technical level of $136.24 will be in play for all of 2016. 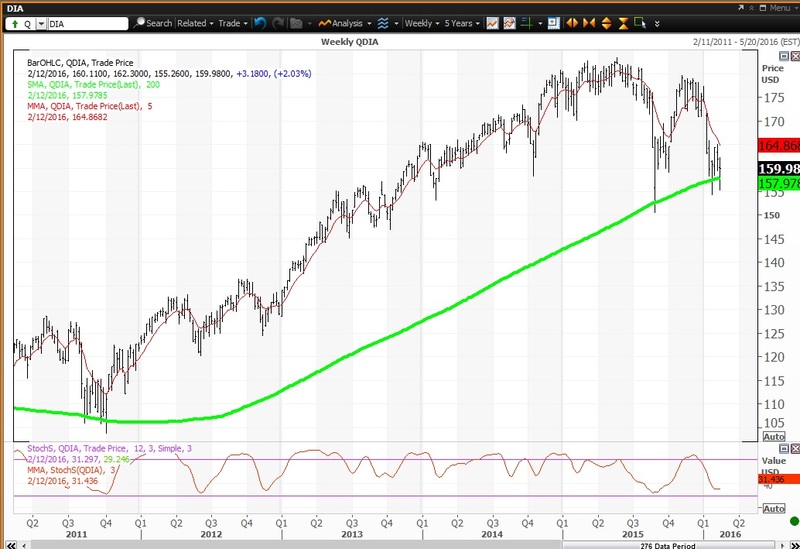 Here's the weekly chart for the iShares Russell 2000 ETF (IWM . 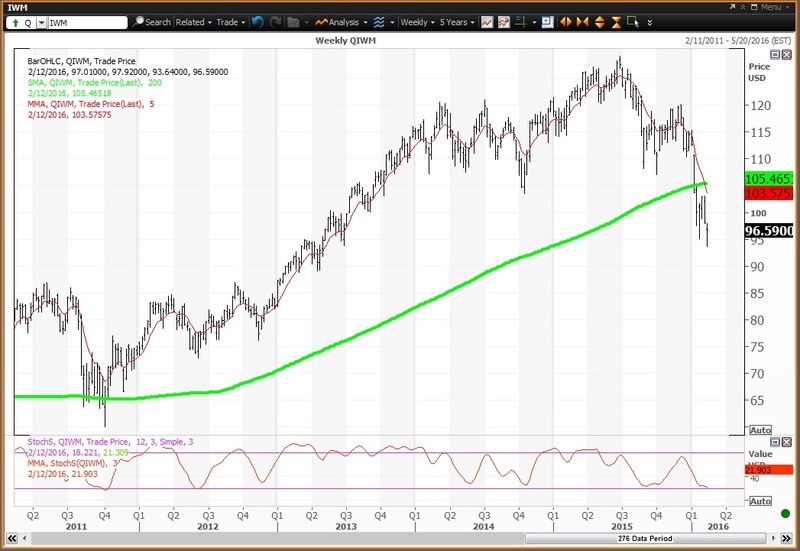 The weekly chart for small caps is negative with the ETF below its key weekly moving average of $103.58 and below its 200-week simple moving average of $105.46. 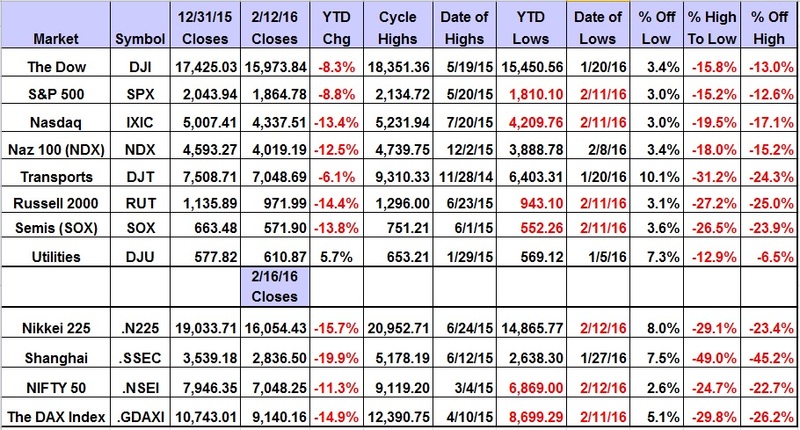 The weekly momentum reading closed last week at 21.90 down from 23.74 on Feb. 5. Investors looking to buy the small cap ETF should enter a good till canceled limit order to buy the ETF it drops to $93.42, which is a key level on technical charts until the end of 2016. Investors looking to reduce holdings should enter GTC limit orders to sell this ETF if it rises to $103.68, which should be a magnet all year.